It is my great honor to tell you that my book has finally been released this week. If you have ever liked any of my blogs or internals, you would like this book for sure. There are lot of things to learn from the book and I can assure you that you wont be upset with this book if you buy it. The "Visual Studio 2012 and .NET 4.5 Expert Development Cookbook" is a book that guides you through steps to ensure you enrich the best experience with the latest technology in the best amount of time possible. The book focusses to give you under the hood expertise in .NET technologies it tends to cover and adapts you the best to face common problems of these technologies. The book is divided in forms of recipes. Each of these recipes gives you clear insight of the problem and step by step process to solve the issue practically. It also addresses the advanced features associated with each of those recipes that gives you additional advantage on getting precise knowledge about the problem and its associated issues. This chapter introduces the intersection of a .NET program and its core components. It dives deep in demonstrating the .NET infrastructure with detailed explanation of memory management and related techniques. It also covers the internals of .NET and understand some of the few great features that you might never came across. The chapter focuses on introducing all existing techniques to deal with threading in .NET followed by the newer patterns that takes over the existing working principles with in-depth explanation on their working principles. The chapter gives you an introduction to latest enhancements of ASP.NET 4.5 with HTML5 and jQuery. It also introduces some of the performance boosters available in .NET 4.5 and Visual Studio 2012 with ASP.NET. It introduces the enhancements to WPF 4.5 and the major components of WPF. It gives a practical implementation of MVVM based WPF application covering all the facets required to program in WPF environment. It focuses on how to implement network-enabled applications in Windows 8 with step by step implementation on how sharing and searching works inside the Windows 8 environment. It focuses on giving insights on how languages work in the .NET framework and C# with details explanation with examples of various features of C# language. 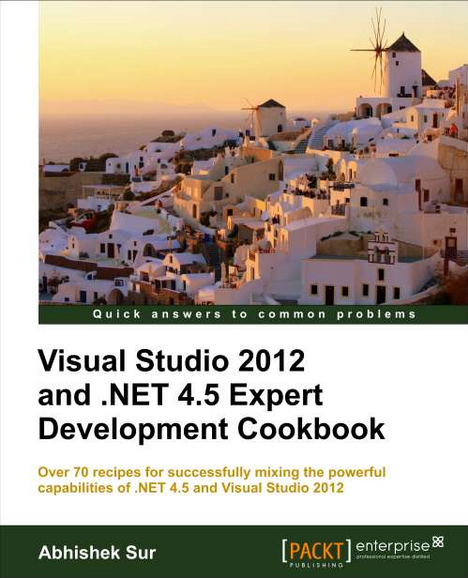 "Visual Studio 2012 and .NET 4.5 Expert Development Cookbook" is a step-by-step practical guide that teaches you how to work with new changes on technology under .NET. It provides in-depth analysis and expert advice on various elements of .NET, applying them in code using detailed practical examples. The book provides solutions to common development problems and helps you adapt to the latest technologies and get to grips with modern app development for the .NET 4.5 platform. "Visual Studio 2012 and .NET 4.5 Expert Development Cookbook" gives you better understanding of overall .NET infrastructure using the latest technology updates, providing a broad guide for a basic developer to become an expert on .NET. Finally, I have written this book to give you clear insights on the ongoing problems and changing technologies. People liked me before when I was presenting problems in my blog, I have kept the same approach on this book and I am sure as a reader I can justice your time from this book. I am sure you will like this book. Do let me know your feedback on it. Write to me at contact@abhisheksur.com on any problem you face while reading this book.